Many people fail to take slip-and-fall accidents seriously. Instead of holding property owners accountable for their part in your injuries, you may choose to bear the costs on your own. The knowledgeable Los Angeles slip-and-fall lawyers of Taylor & Ring understand your hesitation to commence a lengthy legal action, but we know first-hand the years of physical, psychological and financial pain involved with severe injuries. $4.5 million settlement for a construction worker who fell from a defective lift. $2.1 million settlement in a case where an elderly woman fell in her shower and died as a result of burns from hot water. $1.5 million settlement after a man fell to his death in his apartment building. Spills or leaks. If liquid is left on the floor of an establishment, a visitor can step in the spill, slip and fall. Serious falls commonly lead to broken bones and traumatic brain injuries. Establishment owners and managers are responsible for cleaning spills and leaks in a timely manner to avoid preventable risk within the property. Freshly mopped or waxed floors. Property owners and managers have a reasonable need to keep their properties clean, which includes mopping and waxing floors. However, these duties are best handled when visitors are not present within the establishment. Freshly mopped or waxed floors can be extremely slippery and lead to severe falls. 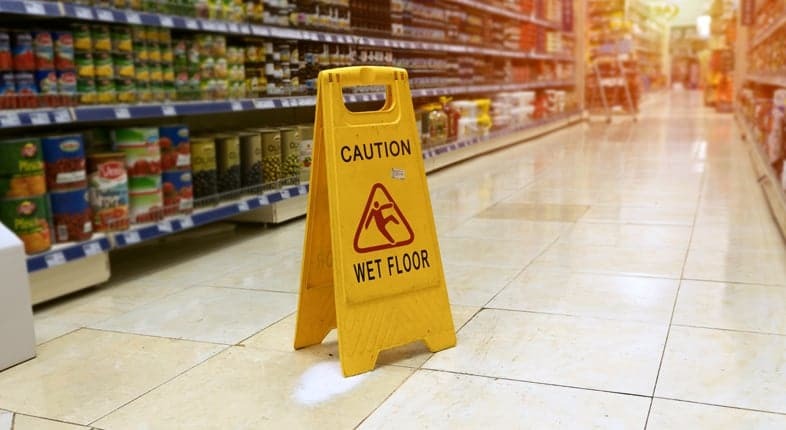 If owners must clean a floor during regular business hours, warnings should be given and efforts made to divert visitors away from the slippery floor. Broken steps or handrails. Stairs are inherently risky, but they are made even more dangerous when property owners fail to maintain them in an adequate manner. Broken steps can cause severe leg and foot injuries to property visitors, while a defective handrail can lead to a severe fall. Uneven concrete or potholes. A property owner’s duty of care is not restricted to the inside of a building. Exterior grounds must also be maintained and repaired adequately. Uneven concrete or potholes can create walking hazards for visitors to the property. If owners know of these dangers and fail to warn visitors, they may be liable for any resulting trip and fall injuries. Unexpected step-up or step-down. Most individuals do not walk with their heads down to the ground, so unexpected steps can be very dangerous. Visitors may trip and fall on a step that is out of place from the rest of the flooring. Our attorneys waste no time in preparing comprehensive claims for compensation in your case. We investigate promptly to preserve evidence of the dangerous condition. We also research prior code violations or lawsuits against the property owner, and whether the property owner had notice of the hazard through complaints, inspections or routine maintenance. Our successful Los Angeles trial lawyers have won slip-and-fall cases against owners of retail stores, supermarkets, restaurants, apartment buildings, office buildings, parking lots, entertainment venues and other private properties. Do you have a viable slip-and-fall case? Not every falling accident or minor injury is grounds for a case. We must first establish that the property owner owed you a duty of care and negligently breached that duty. This burden is most easily met in cases involving businesses, where patrons are invited into the store for a profitable purpose. Establishments like Ralph’s Grocery and The Grove shopping mall owe a duty of care to each and every customer who enters their doors. Service-oriented businesses like Wilshire Massage and Gold’s Gym also owe their patrons a reasonable duty of care. When these property owners and managers fail to fulfill their legal responsibilities, our experienced Los Angeles slip-and-fall accident attorneys hold them accountable. If you suffered serious and lasting injury and the property owner was negligent, we will vigorously pursue damages for your medical care, lost income, permanent disability, and pain and suffering. It costs nothing to discuss your case, and there are no attorney fees unless we recover compensation. Don’t let property owners get away with their negligent actions. You were severely harmed, and all responsible parties should be held accountable. To get started on the road to compensation, call Taylor & Ring at 310-776-6390 or complete our contact form to discuss your situation in a free consultation with our Los Angeles slip-and-fall accident attorneys.